Here’s the video. I will give an transcription of the rhetoric if you can’t bring yourself to watch it. I more than understand if you want to give it a miss (though if you do have the stomach for YouTube comments, the comment section for this video devolves into Trutherism, which makes this video a conspiracy theory two-fer). According to the mainstream media, the second patsy of the Boston Marathon bombings was secretly removed from the Beth Israel Deaconess Medical Center in Boston and taken to a prison facility, where he is allegedly being kept in an isolated cell. Despite the official story about the interrogatory conducted by the FBI and his alleged confession, the fact is there’s absolutely no evidence that he’s still even alive. There’s absolutely no coverage of the mainstream media inside the hospital, no pictures, no videos, no proof that he was ever interrogated. Nothing except the word of the same FBI that framed him and his older brother. In one of the most blatant inside attack jobs ever done within the United States. Matter of fact the last time we saw images of the second patsy was right after his capture in Watertown and inside the ambulance and in my opinion he looks dead in both photos. After Watertown there are no more updated images and the only quote-unquote evidence that he is still alive is the word of the Zionist media and the FBI. Enough said. Considering that the second patsy was conveniently taken to a Jewish hospital and put under the care of an Israeli medical staff led by a Mossad doctor, there’s absolutely no reason to believe a single word about his current medical status. Much by the opposite, the pile of horseshit and deceiving about this whole story is growing bigger every single day, and a new picture allegedly leaked from inside the hospital and published on Twitter seems to add more fuel to the fire. The individual laying on the operating table actually looks like Dzhokhar Tsarnaev and the huge scar in his throat matches the official reports of the Boston police although he is still looking dead in my opinion. And a crucial detail that looks evident after we compare this picture with another one prior to the Boston attacks is his unmatching ear lobe, what gives a lot of room for more speculation and more sensitive questions. Is this a look-alike doppelganger? Is this a dummy? Or is it actually his dead body? Perhaps his skull was blown away by gunshots and they had to partially reconstruct it with someone else’s tissue. What could explain the different ear. And the ear plug suggests the prevention of brain matter leakage. What strengthens the theory is that he was executed like his older brother. The hypothesis of his actual death would explain the whole lack of official images from inside the hospital, the lack of witnesses during the alleged interrogatory, the secrecy of his removal to a federal facility and the isolation without a trial. That’s because he was executed like his older brother and there won’t be any trial. The odds are that the mainstream media will be reporting his quote-unquote suicide any time soon and the bogus confession will serve to whatever agenda the US government has planned after the Boston bombings. But if there’s a trial, they will probably keep the farce with the look-alike actor and nobody except conspiracy theorists will ever notice. This video has spawned almost 60,000 views on StillSpeakingOut’s channel, and I realize that sharing it here will just expose more unsound minds to it but if you can be persuaded that a Jewish doctor will lie about and possibly participate in covering up the death of a Muslim patient because that’s what Jewish doctors do, you were likely in possession of unsound views before you got here. Much of this “theory” is easily explained with a far less sinister outlook. While there is much to be questioned about Dzhokhar Tsarnaev’s case, who exactly does StillSpeakingOut think should have been present at Dzhokhar’s interrogation? The media? A full coterie of photographers? Did he expect the FBI to reveal the whole of the interrogation the moment it was finished? There is little sinister in the fact that no one in the media was present during the interrogation, though there is plenty odd about the interrogation itself. I searched up and down to find a single example of an arrested person who needed medical care being photographed or interviewed by the media when in the hospital. It doesn’t seem to be common for the media to have access to hospitalized prisoners. So unless StillSpeakingOut can show that it’s common for the media to be present at prisoner interrogations, or for the interrogators to reveal recordings of the interrogations pre-trial, or for people in custody who are in the hospital to be recorded by the media, the standard procedures in such situations seem to speak against the access StillSpeakingOut thinks is common enough that he or she is commenting upon its absence. And this is speculation on my part, but I am not surprised at all that Dzhokhar was moved from the hospital to the prison hospital in secrecy. Just moving Tamerlan Tsarnaev’s body to a funeral home caused protests. People didn’t even want his dead body to be buried. Sentiments ran and are still running high against the brothers in Boston. It may very well have been in Dzhokhar’s best interests to have been moved in secrecy. Without discussing the anti-semitism yet, the bulk of of StillSpeakingOut’s video is sheer speculation. Nothing wrong with that in the most liberal approach to finding data. For example, I have to speculate as to why Dzhokhar was moved in secrecy. I try to find the simplest explanation that does not involve an extraordinary number of variables to explain an unknown. I think he was moved in secrecy to avoid protests and potential crowd violence situations. The theory in this video thinks he was moved in secrecy because the officials are covering it up Dzhokhar’s dead and moving the dead body to a different location so they can keep pulling the wool over the American public’s eyes because Dzhokhar is a patsy for a false flag attack that no one seems to know the motivation for. The latter belief has so many variables, far more than just believing it was due to security. Some situations have many variables – life is messy sometimes. But when one does not know the actual truth, speculating with an eye to parsimony is, logically, the best way to go. In all honesty, I can see how someone could look at those pictures of Dzhokhar and think he might be dead. But given the sheer number of people who have seen him or talked to him, from his mother to his nurses to his lawyers, it’s safe to assume he is alive. But the speculation on the part of StillSpeakingOut that Dzhokhar looks dead in those photos can’t be disputed by saying he looks alive. In and of itself it is not an audacious thing to speculate about. But things run logically awry when StillSpeakingOut begins trying to prove Dzhokhar is dead because the information offered doesn’t explore any other alternatives and is cherry-picked to reach the conclusion that the boy is dead or later will be killed. Generally speaking, it’s best to approach a question of, “Is he alive or dead?” and let the information lead you to a conclusion. StillSpeakingOut noticed Dzhokhar had not been seen, wondered if he was dead and then presented only information to show the boy had been murdered, engaging in a lot of assumptions without any proof along the way (both boys were patsies, Tamerlan was murdered, it was a false flag, etc., were all stated as known fact). But when StillSpeakingOut offers what he or she considers proof, it falls short of proving much. 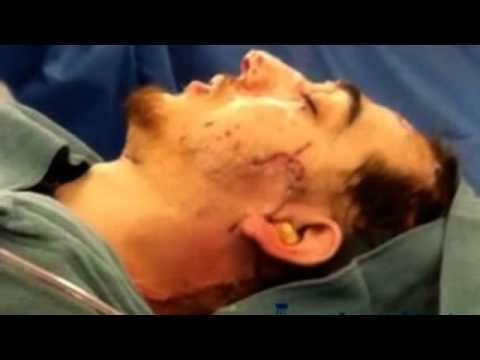 If you watched the video, you will know StillSpeakingOut compared a picture of Dzhokhar Tsarnaev before the bombing to a picture of him on the hospital table and analyzed his ear placement. He or she then declared based on earlobes that men in these two pictures are not the same man. 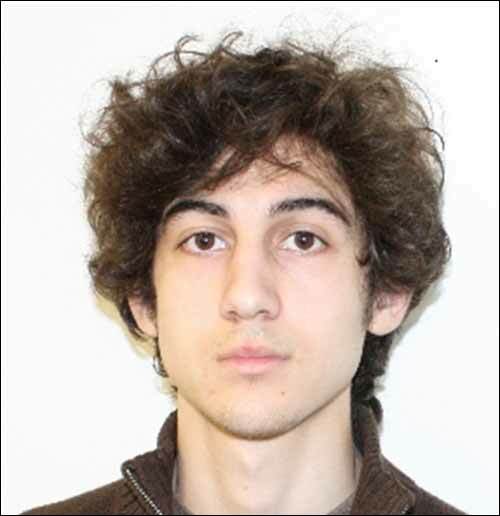 In the picture of Dzhokhar before the bombing, the place on his head where his earlobe attaches on the right side is obscured from view. The left earlobe is a bit more visible but his hair and sideburns make it difficult to tell exactly where his earlobe attaches. There is a far less gory explanation for the earplug than that it is preventing Dzhokhar’s brain from leaking out after his skull was shot off. Flashbangs, also known as stun grenades, were thrown into the boat he was found hiding in. Stun grenades are touted as a non-lethal weapon but they often cause a lot of bodily damage, especially to the inner ear. Tinnitus is not uncommon. Several news agencies reported that Dzhokhar may have suffered ear damage from the flashbangs. Peruse any tinnitus support site and you’ll see lots of discussion about ear plugs. It seems far more likely that the doctors put earplugs in Dzhokhar’s ears because they knew that flashbangs cause intense inner ear disturbance and tinnitus and were inserting them as a pre-emptive pain prevention (which also gives rise to all sorts of questions about how Dzhokhar could possibly have meaningfully participated in an interrogation with his throat shot, a gunshot wound to the head and hearing loss but that’s something else I’ll get to soon). One also wonders why the doctors, if they were reconstructing Dzhokhar’s head from spare parts, would leave a mushy brain inside to leak out. If one is going to create a Frankencorpse to fool the American people, why leave leaky brain matter when you can just scoop it out? And now for the moment we’ve all been waiting for! The anti-semitism. See, even as I enjoy a good conspiracy theory, almost all conspiracy theory has some harm in it. Even if the theory itself is relatively benign in terms of insult and abuse, like NASA faked the Moon landing, to believe in that which has zero proof trains the mind to make the jump into other completely irrational thoughts. Like believing that Jewish doctors will lie about the disposition of dead patients because they’re Jewish (leaving out the sinister implication that a Jewish doctor would participate in killing or refuse to save a Muslim patient – that creepy “Enough said,” said a lot if one has a lot of experience with anti-semites, which I, unfortunately, do). Like that the Jews control the media because the Jews have a nefarious plan for us all and the control of the media is part of that plan. So, what proof does StillSpeakingOut have that Dr. Kevin Tabb would lie about Dzhokhar Tsarnaev’s physical condition? He’s Jewish. That’s it. And because he is Jewish, StillSpeakingOut says he is somehow associated with the Mossad. But in the mind of StillSpeakingOut, a doctor being from Israel means he must be a Mossad agent and therefore the entire Beth Israel Deaconess facility is Mossad-run. I know, I know, StillSpeakingOut has a highlighted article from online that must prove Dr. Tabb is a Mossad agent. Right? This is the article StillSpeakingOut has highlighted in his or her video. The word Mossad doesn’t appear anywhere in the article and that doesn’t surprise me because as I said above, I can find no credible source that shows Dr. Tabb is now or was ever a Mossad agent. And that’s not surprising because members of the Mossad are not easily identified, similar to the state of determining if a person is a member of the CIA. There’s no way to get around saying the obvious – StillSpeakingOut doesn’t have any proof and that highlighted, difficult to read article in the video appears to have been passed off as an attempt to make the viewer think that is has been proven Dr. Tabb is a Mossad agent. The Mossad has been accused of engineering the Boston bombings, yet another theory I will cover in the fullness of time, and I have no doubt that StillSpeakingOut was tapping into the theories that the Jews and Mossad were behind 9-11, Sandy Hook and the Boston bombings. Dr. Tabb was a part of the Israeli military, as are most Israelis because military service is compulsory for them, but being a member of the IDF is not proof that anyone was ever in the Mossad. I suspect the fact that Dr. Tabb was a part of the Zionist Youth Movement triggered the JEWS BAD part of StillSpeakingOut’s brain. So even as people like StillSpeakingOut think noting that someone is Jewish is a de facto way of calling that person a liar or menacing, it looks very much like Dr. Tabb’s hard-won expertise of treating Muslims and Jews in an actual war zone was a plus for Dzhokhar. I know that True Believers who are anti-semitic will not be able to take anything away from this article. But all of this has to be said regardless of whether or not the target audience is capable of appreciating it. Anti-semitism is vile. It is disgusting. And if the people who harbor anti-Jewish sentiment take offense to this assessment of their beliefs, that is not my problem. So please take away from this article that there are plenty of reasons to believe that Dzhokhar Tsarnaev is alive, that teen girls need to research the information they forward each other, and that anti-Jewish sentiment and ideas based on racist insinuations are beneath contempt. Because I am still dealing with the comment situation on this site and writing content for my book site, I have been slower writing about Boston than I would like. But stick around. I intend to get into gear and will be discussing the complete media failure in reporting about Dzhokhar’s alleged activities in the Boston bombing, from a Governor caught in a lie to realizing that the cops may have shot an unarmed teenager climbing out of a boat. Also, if you harbor anti-Jewish sentiment, my blog is not the place for it. Don’t waste your time because even if I am slow to delete, anti-semitic content in comments will not stand for long. Good work. There is more documented back and forth between Jahar and his family, on tumblr. I have looked at FBI’s pics, some mentioned in their complaint against Jahar, and instead of indicting him, they tend to exonerate him. FBI’s Forum backpack pic shows a white shoe sole underneath a backpack. Jahar’s boots had black soles. img src=”http://i.imgur.com/Mf5JCyG.png”FBI’s “711” photo was a SHELL photo, non-robbery, not near cop shooting by black suspect, and, SHELL pic proves Danny lied; there was no carjacking. SHELL pics show Tamerlan was right behind Jahar going in(NOT going OUT–look for push bar on door! ), hence, Danny was never alone with Tamerlan in any car. What the Danny carjacking fakery was about was coverup of police SUV running over Tamerlan. If Danny was carjacked, then Jahar had an SUV, too. On the way in, FBI 711 robbery and cop shooting lies were what precipitated cops to run over Tamerlan with police SUV multiple times, as witness says on youtube vid.